ayondo's net revenue and active clients rose 26% and 24% y-o-y respectively in 1H18. A platform business with superior economics through the network effect. Social trading is an emerging portfolio advisor and manager with higher transparency, better customer experience and accessibility to the masses. Initiate with a BUY and target px of S$0.22. This is based on 6x price/sales of FY18e. The origins of ayondo can be traced back to 2009. Thomas Winkler and Robert Lempka founded the company. In the early years, ayondo was an investment company targeting early-stage fintechs. It was from 2013 onwards that they developed and focused more on white labelling their trading technology and social trading platform. ayondo provides a platform for users to conduct trades by following top traders (i.e. social trading) under their WeTrade platform. Users that transact independently can use the self- directed trading called TradeHub. All the products traded on both platforms are CFDs. ayondo offers a wide range of instruments that can be traded with CFDs, including stock indices, foreign currency, commodities, equities, fixed income, ETFs and cryptocurrencies. Stock indexes and commodities are the most popular products. ayondo has licenses in two jurisdictions namely UK (FCA*) and Germany (BaFin**). It also has offices in Singapore, Spain and Switzerland. The BaFin license allows ayondo to provide financial services in Germany including portfolio management license. ayondo has 2 types of customers, business to consumer (B2C) and technology partner to business-to-business (B2B). The largest market for its B2C offerings are in Germany and UK. Spain is expected to be the next driver of growth. B2B clients are primarily brokerages and banks, in Europe and Asia. For the B2B business, ayondo is the technology provider for CFD products (called white labelling). When an end-client of a B2B broker executes a trade, this trade will flow into and be processed by the ayondo trading engine. 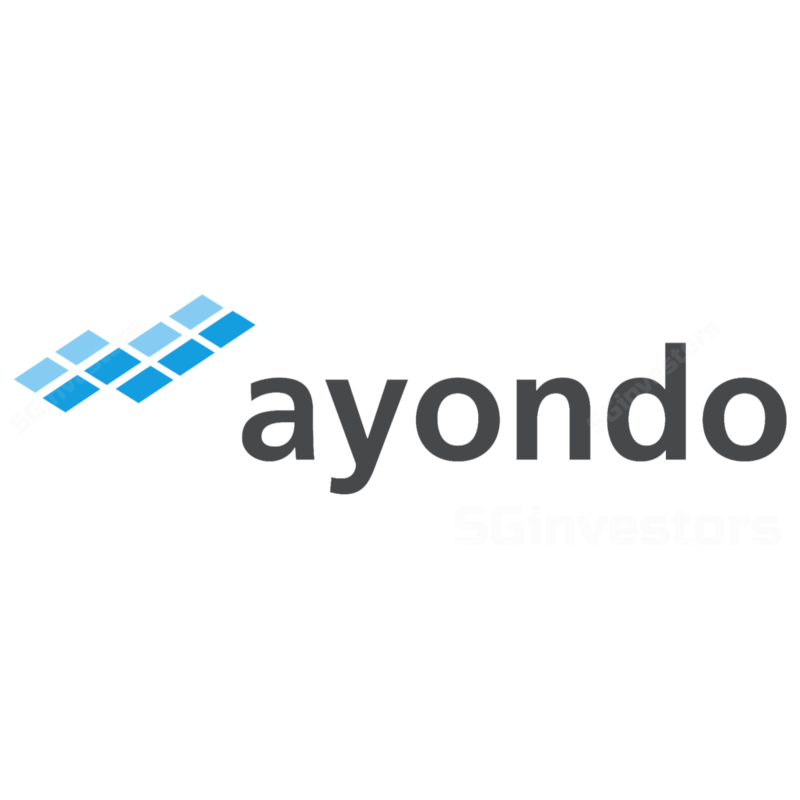 ayondo was listed on the SGX on 26-Mar-18. The IPO price was 26 cents. * Financial Conduct Authority 730 K license to provide CFD brokerage services and carry out trade execution for trades generated by clients. ** Bundesanstalt fuer Finanzdienstleistungsaufsicht (Federal Financial Supervisory Authority). offset or squaring off the position with a trade on the opposing side. ayondo will also earn financing income because CFD products are usually purchased on margin. ayondo can charge interest for the overnight positions. The largest cost item relates to rebates. These are incentives paid to partners, top traders and clients for introducing business. It can range from 40% to 47% of trading and spread revenue. It is to incentivise B2B partners to stimulate client activity. Meanwhile, rebates for top traders as a percentage of gross commission earned on a follower’s trade range from 2% to 12%. Staff cost is around 28% of sales and is expected to remain stable after FY18. Current headcount is 71. As trading revenue ramps up, ayondo can enjoy operating leverage through a stable and relatively fixed staff cost. It hovers around 11% of sales. It comprises mainly of advertising expenses and event costs to attract new clients, create brand visibility and retain existing customer base. Some of the major marketing initiatives include TV campaigns, Fintech events and digital marketing (AdWords and YouTube). B2B help to alleviate some of the marketing cost by introducing and acquiring new customers. B2B partners undertake their own marketing efforts. In the self-directed business, there will be the traditional competitors such as FXCM, CMC Markets, IG and Saxo Bank. In social trading, there are many other platforms in the marketplace. The two most prominent competitor to ayondo will be eToro and ZuluTrade. eToro started in 2007 and is reportedly planning for an IPO. It has raised a total of $162mn and now valued at $800mn. In a series E funding in Mar18, eToro raised US$100mn from China Minsheng Financial, SBI Group and Korea Investment Partners. ZuluTrade was similarly started in 2007 and focuses on U.S. customers. In 2017, ZuluTrade was acquired by China-based Formax Group who also purchased Dayo, the company holding the patents used by ZuluTrade. There is very little data on the size of social trading. A study conducted on behalf of the Federal Ministry of Finance* suggests that EUR190m was transacted on social trading platforms in Germany in 2015. A 63% rise from 2014. There are at least 14 social trading platforms in Germany alone. The three market leaders in Germany are Wikifolio, eToro and ayondo. Market penetration of assets under management by social trading, robo-advice providers and others was approximately EUR1.36bn in 2015 (or 0.1% penetration combined). It is expected to grow to EUR40bn in 2020 (CAGR 96%) and EUR68bn in 2025 (CAGR 48%). ayondo has an attractive platform business that is enjoying fast growth as the concept of social trading as an alternative investment class takes off. Superior economics of their platform business. Platforms offer an attractive and superior business model. They erect huge barriers to entry through the network effect. As the number of social trading followers increase on ayondo’s platform, it will attract even more top traders and vice versa. This interaction sets up a virtuous cycle of value creation and linkages on both sides of the network. This can differentiate and protect a business. In such a two-sided market, the users on one side of the network affect demand for users on the other side. An additional benefit to ayondo will be to its market-making spread business. As the number of orders accumulate, the risk to its trading book tapers down as these transactions have a higher opportunity of offsetting each other. In 1H18, ayondo's revenue rose 26% y-o-y. Since 2014, revenue has been up five-fold. The IPO capital raising exercise has been a noticeable distraction in the near-term. We expect future growth to come from new geographical markets, greater awareness of social trading, new products and more white-label B2B contracts. Growth driver 1: New Geographies. We expect ayondo to expand into more countries, such as Spain, Benelux countries and Scandinavia region. This will require more marketing effort and spending. Europe will be predominantly B2C market while Asia will be an opportunity to market their B2B trading solutions. Growth Driver 2: New Products. We expect continuous enhancements to their product line. Some of these will include creating a simple one-touch portfolio of all the top traders, rather than followers having to spend time and effort to study further which are the top traders that suit them. Another initiative is to involve small (or sub-scale) fund managers looking to build a track record through WeTrade platform. As cryptocurrency is already traded on the platform, we expect ayondo to also include crypto as part of the “currencies” for settlement or funding of trades. Growth Driver 3: More Partners. To fast track the scale or network effect of the platform, we expect ayondo to sign up more partners. Any partnership with banks will be a major catalyst. As banks try to widen their revenue sources and attract the millennials, social trading will be a useful asset management solution. Banks can provide a huge swath of customers into ayondo’s platform. For the broking partners, it will be to support brokers that already offer CFDs with a more complete suite of products (such as cryptocurrency) or brokers that have only starting to introduce CFDs (e.g. Malaysia). accessibility to an underserved mass market given a reduced minimum investment threshold. As at Sep17, BUX accounted for 2/3 of ayondo active clients. BUX BV has been successful in offering casual trading through mobile. There are not many complex products or features for BUX, but just a simple single price to purchase financial products. Since ayondo onboard BUX customers, they technically belong to ayondo. Because ayondo is a counterparty to customer CFD trades, it will carry the risk of the trade onto it books. It relies on its internal value-at-risk (VAR) model called global risk model to manage the number of positions that need to be hedged out. ayondo VAR model has ridden out some volatile trading days the past few years, such as UK’s exit from European Union, the United States presidential election 2016, the Swiss National Bank’s removal of currency peg in 2011, and the Greek debt crisis between 2009 and 2016. On average, there could still be down days in a month. ayondo is responsible for customer due diligence including the end clients of their B2B partners. The only exception are end clients of B2B partners that have omnibus arrangements with ayondo. ayondo contracts only with the omnibus partner. The omnibus white label partners are responsible for complying with the customer due diligence requirements in the relevant local jurisdictions. Because ayondo has a FCA CFD broking license in U.K. A so-called ‘’hard’’ Brexit will imply this license is no longer valid or applicable in European Union (i.e. cessation of passporting rights). Some solutions for ayondo include upgrading German license to broking license. Alternatively, Spain is also fast-tracking broking license. In 1H18, ayondo had a negative operating cash flow of almost CHF5mn. And cash on hand is only CHF3.2mn. We initiate coverage on ayondo with a BUY recommendation and a target price of S$0.22. There are no comparables for ayondo. We instead peg ayondo valuations to the listed fintech universe globally and attach at least a 50% discount to the price to sales valuations. Fintechs are trading around 14.5x price to sales. Based on 6x price to (net) sales FY18e, we derive a S$0.22 valuation for ayondo. We used net sales (after rebates), as it better reflects revenues sourced from the B2C or social trading segment.